The Forgotten Frontline: Custard Cream Castle - Could we do something like this in Kent...?? Custard Cream Castle - Could we do something like this in Kent...?? Could we do something like this in Kent..?? Carlisle Castle has been recreated in cake form by a team of volunteers armed with thousands of custard creams. Staff from three local baking firms used 5,000 of the biscuits to help create the structure as part of the city's summer pageant celebrations. 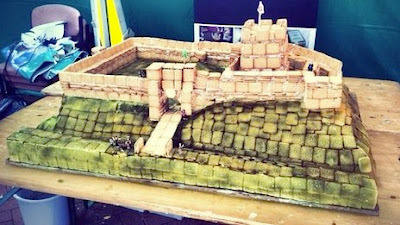 It took the group three days to complete the castle, which measures about 1.2m (4ft) square. Visitors were able to sample a piece of the creation during the pageant. Volunteers came forward after a Facebook appeal from English Heritage, which runs the castle.